As per the directives of the President His Highness Sheikh Khalifa bin Zayed Al Nahyan, and orders of His Highness Sheikh Mohamed bin Zayed Al Nahyan, Crown Prince of Abu Dhabi and Deputy Supreme Commander of the Armed Forces, at the conclusion of his visit to the Arab Republic of Egypt, the UAE has pledged $4 billion in support of Egypt. Of this, of which $2 billion will be allocated for investment in a number developmental fields in Egypt, while the other $2 billion will be deposited at the Central Bank of Egypt to support the Egyptian cash reserve. This support comes in the framework of strategic co-operation and co-ordination between the two countries. It also stems from the UAE’s firm stand in support of Egypt and its people to promote the reconstruction and development process, as well as in recognition of the pivotal role of Egypt in the region. Sheikh Mohamed bin Zayed reiterated the UAE's support to Egypt and its people, to achieve their aspirations in the stability and development, noting that Egypt is a pillar of stability and a safety valve for the region given its strategic and security weight, and its leading role in the region. 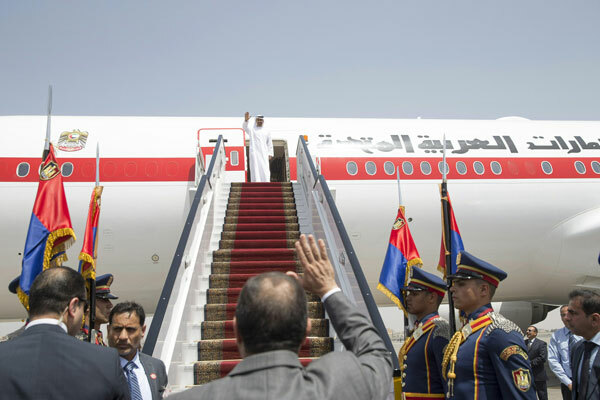 His Highness Sheikh Mohamed bin Zayed Al Nahyan, Crown Prince of Abu Dhabi and Deputy Supreme Commander of the Armed Forces, left Cairo on Friday following an official visit to the Arab Republic of Egypt. He was seen off at the Cairo International Airport by Abdel Fattah El Sisi, President of Egypt, and a number of senior Egyptian officials. Accompanied by President El Sisi, Sheikh Mohamed bin Zayed made an inspection tour to The Sheikh Mohamed bin Zayed Residential Complex project, which is 12km long and 6.5km wide, and spreads over land area of about 20, 000 acres. The residential complex connects Cairo city with the new administrative capital project. The new neighbourhood includes financial, business and residential districts, science city, medical global city, and a smart village, in addition to an exhibition centre, entertainment and service centres. It also has several restaurants as well as trails for bicycles and pedestrians. The Mohamed bin Zayed project is linked to the new administrative capital through the two bridges at the Sheikh Mohamed bin Zayed intersection on the regional ring road. The foundation stone of the project will be laid at the end of May and construction of roads and utilities will be completed within two years. About 50 Egyptian construction companies with a total of 50, 000 engineers, technicians and labourers are working at the mega project. Sheikh Mohamed wished Egypt and its people success, progress and prosperity, praising the efforts of the government to achieve comprehensive development to meet the aspirations of the people of Egypt. He was accompanied during the tour by Sheikh Abdullah bin Zayed Al Nahyan, Minister of Foreign Affairs and International Cooperation, Ali bin Hammad Al Shamsi, Deputy Secretary-General of the Supreme National Security Council, and Mohammed Mubarak Al Mazrouei, Under-Secretary of the Crown Prince's Court of Abu Dhabi.